Zhoushan Putuo Dongji Town is located in the easternmost islands of Zhoushan Archipelago street, east of the East China Sea, and south of Yang’an Fisheries, while North to Shengshan Fisheries. 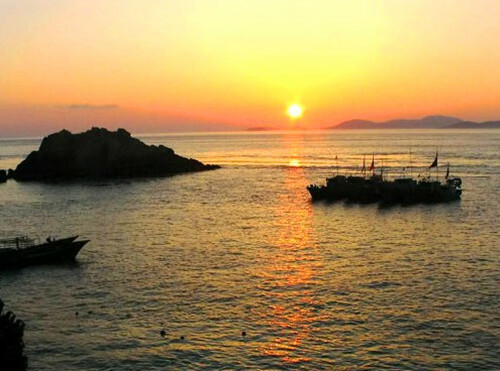 East Sea is a very important part of the Zhoushan fishing ground, which is located in St. Archipelago. It has a superior unique location, breathtaking polar scenery, rich and diverse reef shellfish resources, and its quaint rich fishing culture are loved by everyone. 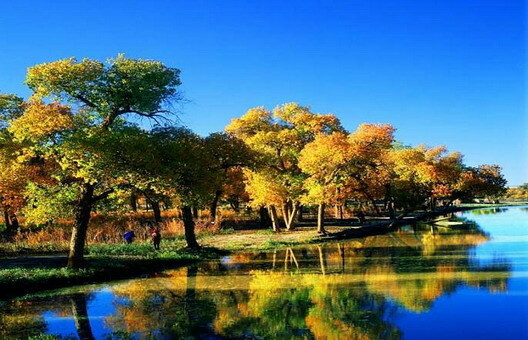 Dongji Town not only owns thick atmosphere of fisher, but also enjoys pleasant climate. At here, there are often changes in the sea all year round: the beauty of Dongji Town is compared favorably with Hangzhou West Lake; its tide fluxes like Qiantang tide. The islands have “clouds island” reputation, every spring, summer, clouds floating around the top of the island, and the coast is sunny and spectacular. Every summer, Donji Town becomes the heaven for swimming and fishing. 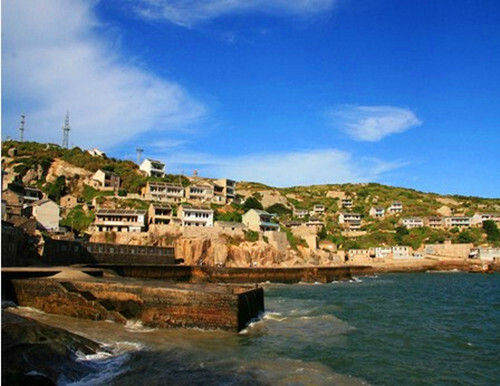 Visitors who came to here said: “Seafood in Dongji is the most fresh I have ever eaten.” Therefore, the unique resources of Dongji Town constitute its special environment as it covers profound military culture, folk culture, fisher arts culture and seafood culture. In addition, “Donji fisherman painting” at home and abroad and the arts have enjoyed a certain popularity as a fishing village style beautiful picture, filled with contemporary folk painting it the sea as the background to the fishermen’s production and life as a theme, performance practices neither the traditional folk art of plain moderation, not be bound by the established norms of the Institute, has revealed the sea to be free and innocent–innocent and lovely, poetic distinct personality. Whether it is a rich subject matter, or the distinctive local characteristics or unique artistic expression, has its own unique charm. http://www.chinafacttours.com/ is your faithful China tour partner, if you’re interested in any ideal travel places in China, please contact us for more information. Or if you want to travel to Zhoushan, we recommended you to choose our Shanghai Tour. 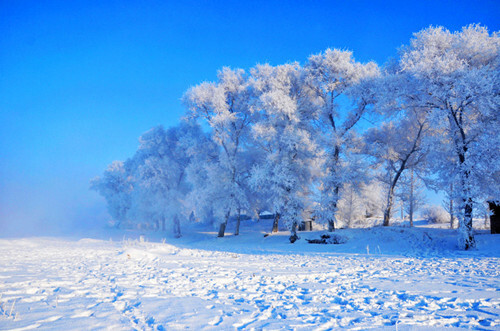 Jilin Rime, refers to the natural wonders in the city of Northeast China—Jilin. Featured graceful, unique, charming, and with constant stream of foreign tourists’ praise, Jilin rime not only is a popular winter attraction, but also makes a great contribution to the natural environment and human health. In 1985, along with the picturesque landscape of Guilin, Yunnan Stone Forest, the Three Gorges, it is regarded as one of the “China’s Four Natural Wonders” by the state authorities. In the frozen season, vegetation are dying and things have lost vitality. However, the spectacle of rime is always able to “suddenly, such as spring night, the Trees of pear blossoms” to come to North River.” The dizzying and wonderful sights of the icy but graceful willow branches and cypress pine will give you unforgettable memory of beautiful winter. The formation of Rime—Every winter, although the Songhua River is frozen as hard as iron, tens of meters deep in the water below the ice can still maintain the temperature at 4 ℃, while water temperature and ground temperature difference constant at about 30 ℃. Therefore, the rivers in the urban area are not frozen. The wide range of temperature produces mist and river mist curl, which eventually becoming dissipated. 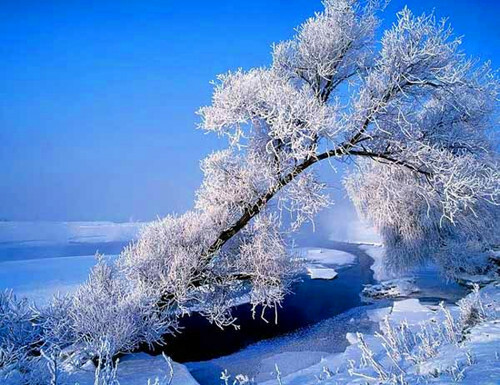 Under the action of a certain pressure, wind direction, temperature and other conditions, a large number of river fogs occur cold condensation in the form of frost on the thickness around different branches, forming a large area of rime wonders. 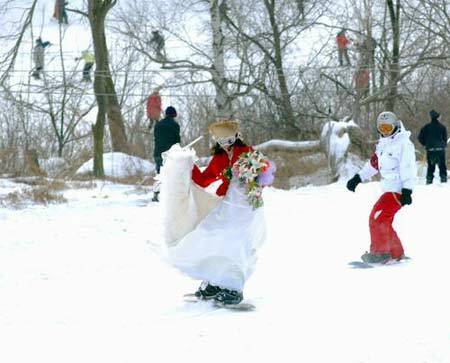 The Best Time to See– Every year from late December to the end of the following year’s February, are the best season to watch rime in Jilin City. At the most, there may be more than 60 times a year. The Process of Rime Sight-seeing—the process of enjoying the rime scenes roughly into 3 stages, namely “watching the fog at night, watch the hanging of rime in the morning, and seeing its falling in the afternoon.” Each session can make people feel a different surprise. Generally, the scene occurs at 10:00 at night along the Songhua River. The mist begins to appear and then more and more with cold concentrated, large group of mist rise up. Covering by thick fog, the buildings at the riverside, the trees, everything in the whole street seems in a sea of clouds in wonderland. In common, the more dense the fog at night, the more spectacular the rime landscape become the next morning. In the morning, you can see “Hanging Tree” along the street, which presented a silver fantastic and wonderful world of winter. Each one willow branches are sparkling, like Tamae hanging, rocking gently in the breeze. Even the roadside grass, also rime wrapped furry. In the afternoon, the rime will fall off. 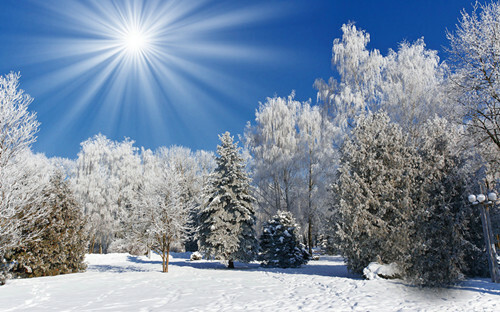 Usually, after 9:00 in the morning, the sun rises up and the prompting condenses on the branches of rime began to fall off. The breeze blowing off the silver pieces flying in the air, bright sun shine to the above, in the air, forming a colorful curtain of snow. Rime swirling like snowflakes fell on people’s heads, shoulders, which let people feel extremely cool and fresh. 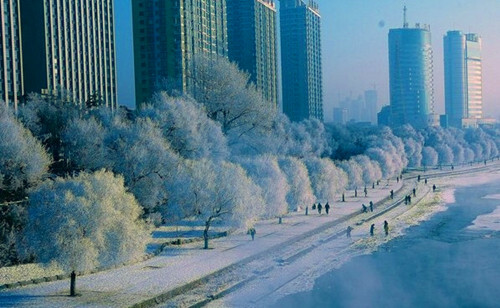 –If you want to explore the wonder of Jilin Rime, you can click tours @ Jilin tour or choose to have fun at the wonderful popular winter holiday city Harbin. In 2005, Danba Tibetan Village was awarded as the most beautiful village among the other 6 ancient villages in the campaign“The Most Beautiful Place of China”, which was hosted by Chinese National Geography. Danba Tibetan Village refers to villagers who live at Danba county and gradually form the Tibetan village. The cottages has its unique shape: the combination of stone-house and village houses. In appearance, the cottages harmoniously being colored in yellow, black and white on their featured roof. Besides, the houses usually have 3 or 4 stores, while there are lodges by the side. Danba Tibetan Village was built at the foot of mountains and make uses of the advantages of natural environment, which resorts to the principal of “Unity of Heaven and Man”. Commonly, the cottages are settled at the slope side facing south and compose several families. Blue sky, stretching mountains, green forests, clear lakes and brilliant houses–what a picturesque and wonderful land here it is! If you appreciate the whole Danba Tibetan Village from a further sight, you’ll be amazed by its flexible outlook with white clouds surround and regard it as a fairyland which totally different from the scenes in the bustle city. Danba County has rich travel resources with magical and beautiful natural scenes: the natural landscape, Dangling Sights, Jixue Mountain, forests, hot springs, grassy meadows–all give you pleasant and refreshing feeling while traveling in this area. It’s the ideal place for you to relax, explore and return to the natural pure world. Luo Bu Pu: it means the treasure of good luck which is the main resort for explorers and pilgrims who want to reach the peak of Moerduo Mountain. The cave on Luo Bu Pu once was the place where those enlightenment monks went for cultivation. Fairy Lake: it is famous for its paradise-like surroundings where there are two springs–clear, pure and cheerful flowing. Suo Po: Danba is named“Thousands Stone-houses and Ancient Villages”while Suo Po is the concentration place of the best-preserved and spectacular stone-houses. However, only one stone-house can visit to which is the house of the Geluwengdu Family. Dangling Scenic Spot: it is a wild area for variety attractions–Paradise Valley, hot spring, Tibetan villages, Calabash Sea, Zuoyongcuo, etc. If you want to explore this area, the means of transportation can only be riding horses or hiking. The grand plateau scenes will let every effort be deserved. Besides, the best time to visit Dangling is around November. Calabash Sea: it locates at the mountain not far away from Dangling Scenic Spot and being named after its calabash-like shape. Surround the sea, blossom flowers, green pine and cypress make this place great and magnificent. It is also the ideal place to enjoy the sight of sunrise. Hot spring: 3 or 4 kilometers away from Dangling, there are two natural sulfurous hot springs. You can enjoy leisure time there to recover from body and spirit fatigue. –Danba Tibetan Village is a mysterious and unique place for your exploration. If you’re interested and eager to wander around. Be the partner with us CFT now. 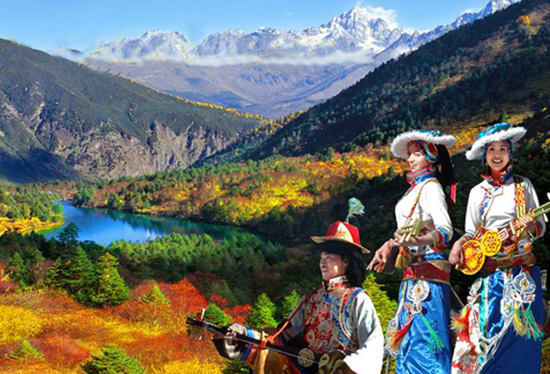 Our Sichuan tour for you will be the most thrill and fantastic experience. The Cai Family Ancient Folk Houses is located at Zhangli Village, Guanqiao County, Nanan City of Quanzhou, Fujian Province, China. It was first built in Qing Dynasty ( 1862-1911) with 49 years of construction. The architecture here has its own unique and outstanding designs that features as magnificent momentum, well-formed structure, exquisite carvings, which shows the “Southern Fujian architecture style”. The grand scale of the houses is regarded as the “Unique in the World” ancient buildings with rich culture and civilization and is the lively representative museum of Qing Dynasty buildings. There are 23 buildings in exist which not only represent the elaborate caving craft with birds, lions, tiny animals, flowers true to life of southern Fujian cultural style, but also own elites’ poetical work, painting and calligraphy more than 200 pieces. That’s to say, it’s a great treasure which combines local essence and under the influence of western architecture art, Indian Buddhism, Southeast Asia culture, etc. In 2001, it is listed as the National Key Cultural Relics Protection Unit by the State Council. As the saying goes, “architecture is solidifying music.” The ancient folk houses of the Cai Family justify it–the houses are facing south, lies in 5 rows with 2 buildings together. Between the 2 buildings, there are fireproofing path which are made of tidy stones. What a marvelous and advanced project in the old days! 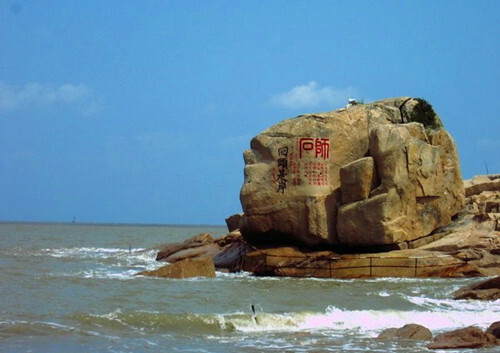 Because of it coastal location and frequent oversea’s intercommunication, Quanzhou enjoys the reputation of “ Oriental First Port” and “ the Starting Point of Maritime Silk Road”. 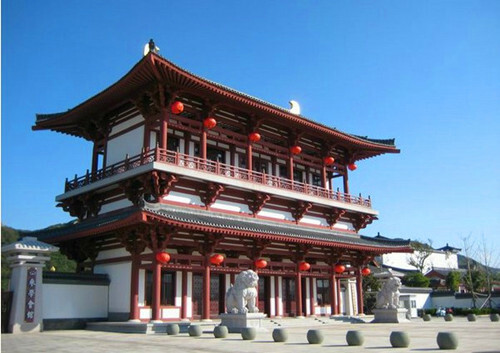 Therefore, the blends of different culture gradually forms the special culture and architecture style here. The houses of the Cai family are all in red bricks. In Fujian culture, it has other beautiful name called “Red Adjacent”( 红厝，Hong Cuo). Wandering around the houses, the straight roads, the blue sky, the fresh air, are all giving you a refreshing experience which is totally different from the life in the bustle city. “Peaceful” is what the Cai Family ancient folk houses can bring to you, both its surroundings and your spirit. “Weather-beaten” may be another word you’s like to describe these ancient houses. Life still goes on here along all the way from old times to today. People’s life here possess many old living flavors–the socialism slogans and the worn-out posters on the wall, all tell you about old stories behind the history. At here, stone articles are everywhere. The well-carved stone desk, well, mill which are sparkling their unusual characters just as those red buildings. Then one design of the houses should be recognized is the roof and check. The form of the roof is some kinds like the tail of swallow with curvaceous lines. It’s efficiently use for draining off rain, weakening the wind and protecting lightening. Moreover, on the roof or along the check, there are many ingenious patterns with bright colors. Doors are also with old distinguishing features–the carving magpie, plum blossom, Chinese dragon on the surface show the delicacy of the houses at the first sight. Besides, you can resort to some poems and paintings on the lintel of the door which actually give you the fun of contemplation. If you’re interested in these ancient folk houses of the Cai Family or some other kinds of attractions in China, why not follow our CFT tour in Fujian? In Fujian area, there are various and unique highlight spots, for example, Tulou, Gulang Island, Wuyi Moutian…All are waiting for your exploration! On July 1st, the official business operation of high-speed train from Nanjing to Hangzhou (Ning-Hang Line) and Hangzhou to Ningbo (Hang-Yong Line) started. G7534 is a new train, with 16 carriages and 1,015 seats. The ride between Hangzhou and Nanjing is 1hr10min (250km). Between Hangzhou and Ningbo 1hr (170km) and Shanghai to Ningbo 1.5hr (300km). What a flying experience! The journey is half of the train time before and it means that the “One-Hour Economic Circle” of Yangtze River Delta is formed. Since the opening of Ning-Hang-Yong high-speed rail, travel becomes the hot topic among travel agents and citizens. It makes it possible for one to take in the highlights of the three cities in one day. From Nanjing to Hangzhou, the cost of a second class seat is RMB79.5 (USD13), a more comfortable seat than an economy seat on flight. Compared with self-driving travel, it is a lot cheaper and more convenient. This high-speed line stops at famous tourist attractions like Hengdian Film Studios, Changzhou Dinosaurs Park, Zhouzhuang water town, Tianmu Lake, Wuxi Lingshan Buddha, Hangzhou Thousand Island Lake, Xitang Water Town and etc. For inside facilities, G7534 provides power plug (220v ac) under every seat, enabling laptop use and battery charging. Wi-Fi is not provided for the time being. There is a wireless network named “CRH-380-TC02”, it is for the train technical communication system only. Mobile phones are not affected but web surfing can be interrupted. Western toilets are available at the end of each carriage and are the best standards of all trains in China (comparable or better than the Eastern Coast Trains in UK). With the great changes in people’s life today, more and more citizens have varied ways of travel. They may choose travel with group, self-driving travel, and travel by train, etc. Then the opening of G7534 high-speed rail not only speeds up, but also stimulates family travel around Yangtze River Delta. At the time of its operation, many travel agents have already promoted travel products based on high-speed trains. During this summer holiday, along the new high speed rail routes, travel products like “entrance tickets + hotel” is getting quite popular. Starting from this summer, traveling by high-speed train in Eastern China will be the “Fashion”. Come and enjoy your inter-city travel with China high-speed rail! For more information about China travel, please click to our website: CFT or visit the train tour page. As a good old tradition of the Dong (link) people, the worship of Sasui is of utmost importance. Sasui is the source of Dong people’s life and she is the goddess blessing them with good harvests, health and the happiness in life. It is an emblem of the matriarchal society of the Dong people for thousands of years. The Sasui statue is places in a shrine protected with rattan and wood so it is not damaged by human or animals. It is stored in a holy place. She will be carefully carried out and placed on an altar for the 3000 Dong people in nearby areas to worship. Each spring at Baozeng Dong village, the ritual takes place with traditional Dong singing and dancing. According to the legend, Sa protected the Dong people against the intruders and finally died by jumping off the cliff. Afterwards, Dong people set up sacrificial altars in mermory of her extraordinary bravery and fearless self-sacrifice. The ritual consists of Raw Sacrifice, the Parade, Cooked Sacrifice, Singing & Dancing, Hundred-Family-Banquet. Raw Sacrifice takes place at dawn. The village Shamans and venerable elders carry the freshly butchered pig to the holy place where Sasui is stored. Ritual is performed to “invite” the Goddess to go out for the mass worship. Then the Parade. The statue is carried out by strong men, led by the Dong shamans, followed by “guards” (dressed up villagers) and other villagers carrying bunches of rice straw and gift baskets. The direction of the parade is determined by the shamans, judged by their own mythical calculation. The Parade goes thru the villages in the “Gold Basin” to hand out blessings, performed by the Shamans. When passing the Wind & Rain Bridges and Drum Towers, the Sasui Parade stops over to perform rituals to the various gods. In return, the villagers put their red bags containing money to the basket placed in front of Sasui statue. Dong people dance, sing and sacrifice animals to Goddess Sasui to pray that she bless and protect the village. 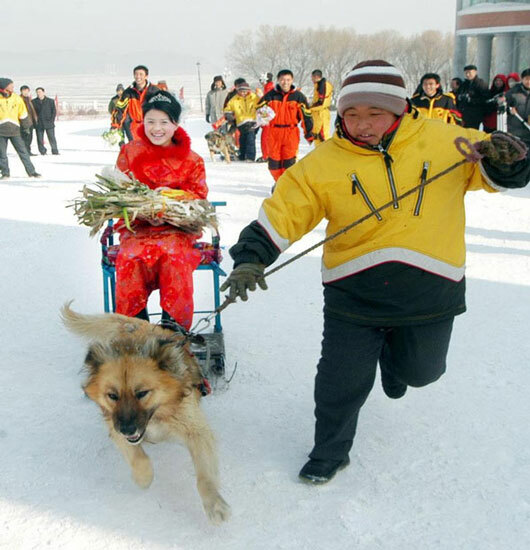 On the same day, after the ceremony came the “Hundreds-Family Banquet”. Numbers of tables were lined along the streets and the big feast was kicked off at 2:30 pm and lasted to dusk. Around noon time, Sasui Goddess comes back to her shrine in the main village and receive tributes, this time, in the form of cooked food. This is the Cooked Sacrifice. Cooked pig heads, trotters, and tails are presented along with 24 bowls of rice porridge. Incenses and paper (imitating money) are burnt by the worshippers. Singing and Dancing is the next and held at the central stone platform (could be cement, earth or mixed) where a big fire is lit up and kept till the end of this part of ritual. Performing troupes from various villages join with traditional Duoye Dance, Lusheng Musical Dance, Beat the Rice Cake Dance, Story Telling, Stool Dance, Cloth Beating Dance, and Dong people’s Pipa Musical. At the end of performance, people rush to the fire place and take a small part to their own house to show the blessing will be transferred to their own family. Near dusk, low tables and long wood stools are laid out, one next to each other, forming a very long dinner table. The visiting Dong people, from as far as Hunan province, and the entire main village will be out dining, drinking and singing. Pickled meat, fish, duck are presented, as they are the best food of the Dong family. Some are raw meat steeped in sour soup for over a year. Some are placed right on a burning charcoal for the best flavor. Fun continues till late into the night at Baozeng. And the hospitable Dong people is always ready to ask a visitor to join and share. The ritual of Dong people paying homage to the Sasui Goddess has been listed as an Intangible Cultural Heritage. Baozeng, called the “Gold Basin”, refers to the 8 or 9 villages dotting around a valley near Longsheng County. 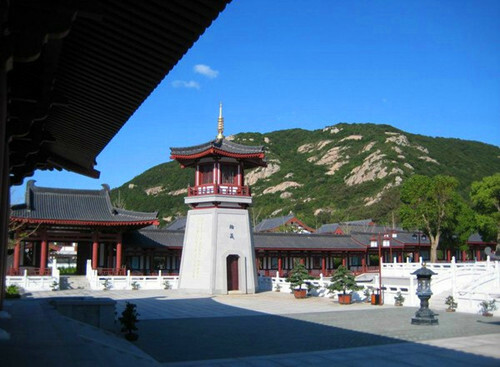 Built during 1368-1398 during the Ming Dynasty, it was little touched by the outside world. Now with the roads paved for motorized vehicles, it is easily accessible from Guilin, around 4hrs drive. From Longsheng, it is nearly 2hrs drive. Contact us if you wish to experience this authentic cultural activity. Our website CFT offers all kinds of fun about China travel. If you’re inerested in the above holiday, why not click to Guilin tour to know more or explore other interesting travel spots? 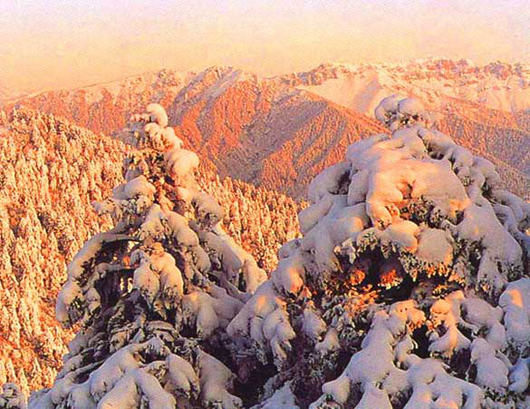 Xiling Snow Mountain is the optimum place to view red autumnal leaves and snow in Dec. The Xiling Snow Mountain, towering in Dayi County about 90 kilometers from Chengdu, ranges 484.8 square kilometers in area. The mounatin is a national scenic area known for its virgin forest and alpine landscape. Fall is an elegant seson in Mt. Emei. During the time, the red leaves scattere over hills and dales. 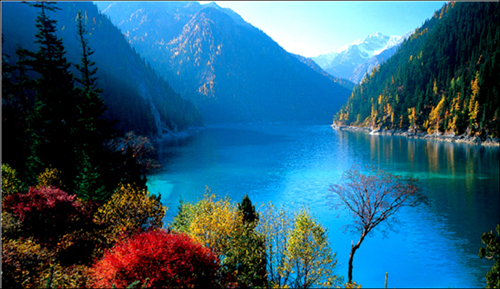 Jiuzhaigou Valley is a paradise of photographers during the golden fall. This wonderland is famous for its water, cascades, colored lakes, springs, mountains, forest, valleys, flowers and read autumnal leaves. Yading is one of the famous Tibetan Kham Areas and known as the last Shangri-la in China. 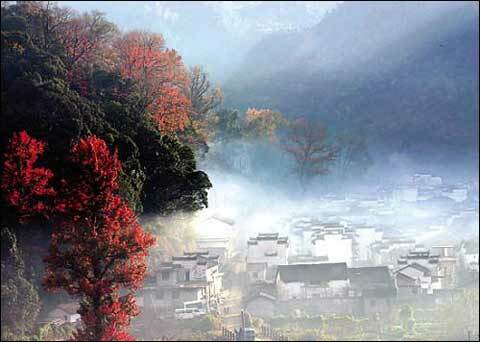 The picturesque red leaves landscape in Wuyuan, Jiangxi Province. Wu Gorge is an important part of the Three Gorges. 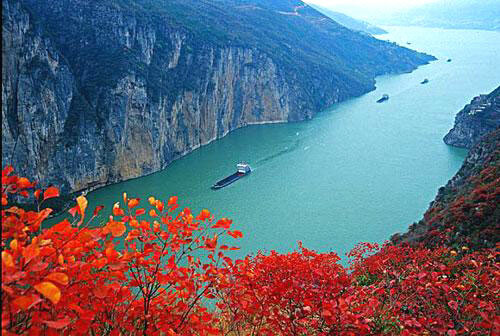 Most of tourists make a cruise on the Yangtze River on Nov. and Dec. just for its beautiful red leaves. 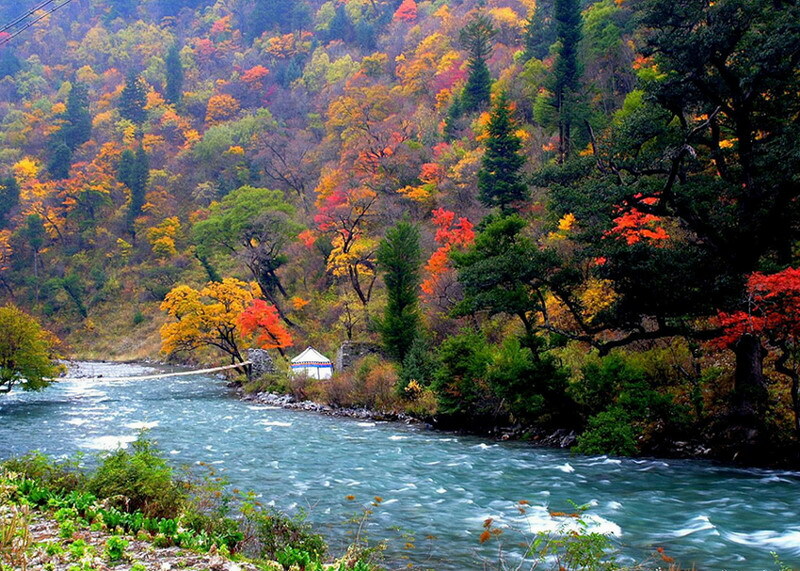 Miluoya Scenic Area is located in Aba Tibetan And Qiang Autonomous Prefecture of Sichuan Province, about 263 km from Chengdu, the capital city of Sichuan. Miluoya means “an interesting place” in Tibetan language. It is the biggest read leaves scenic area in China. 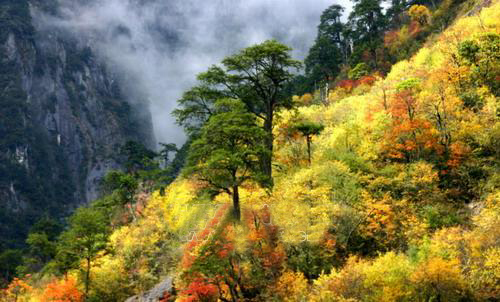 The snowclad mounains serve as the background of the the read leaves in Hailouoguo Valley during autumn. 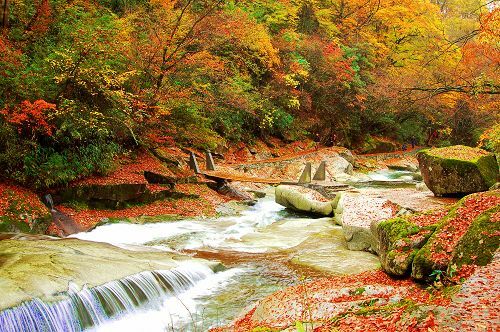 Guangwu Mountain is located in the north part of Nanjiang County of Bazhong City, Sichuan Province. The mountain enjoys the reputation of “China’s No. 1 Read Leaves Mountain”. Every autunm, thousands up thousands of tourists flock there to enjoy read leaves. Best enjoyed the red leaves of fall, Mugecuo Lake area also provides the most beautiful sights of lake, snow mountains, valleys and some other natural beauty. 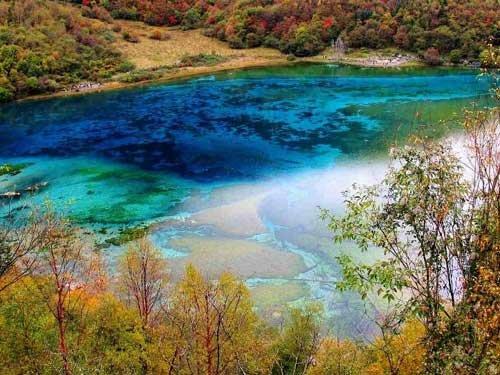 Mugecuo lake is the largest lake in the west-Sichuan, about 17 km from Kangding, and 322 km from Chengdu, the capital city of Sichuan Province. What will you do when the winter is coming? 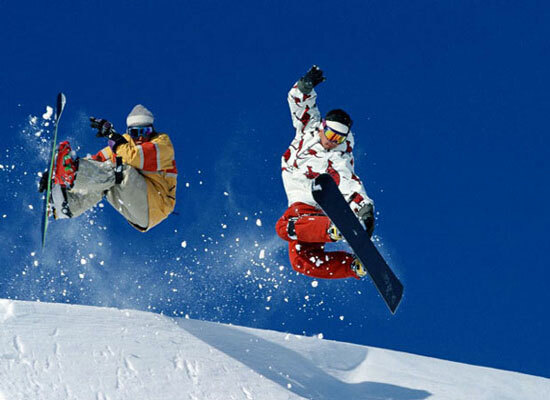 If you have no idea, come to Harbin Ice and Snow World to enjoy the most recreational winter activities and experience the most forms of entertainment. Harbin Ice and Snow World is one of the major venues for the International Ice and Snow Festival which officially opens on January 5 every year. The park features many large ice and snow sculptures based on landmarks from countries around the world. Harbin Ice and Snow World is a wonderful place which so far shows the largest ice and snow art, ice sculpture exhibition in the world. It always provides visitors with a totally unique and unforgettable experience and memory every year. What makes me excited is that, here, I can find the most beautiful art attractions, appreacite amazing night views, enjoy the most recreational winter activities and experience the most forms of entertainment. Ice carving is the typical thing you can do in the Ice and Snow World. Visitors will also be amazed by the magnificent ice sculptures and buildings, including ice cartoons, ice bar, and even an ice hotel. These ice items are regarded as some of the world’s finest examples of ice art. Each of these ice carvings is designed in some way related to the festival’s theme, enabling travelers to sample a variety of cultural flavors. Another thing you just remember, to visit the site at night! The colorful lights set underground illuminate the various kinds of ice sculptures like the great Buddha, lovely puppies, tigers, cartoons, the Snow White, the Seven Dwarfs… The contrasts of the bright and dazzling lights against the dark night sky make the works look all the more spectacular. Regarded as an Ice Disneyland, Harbin Ice and Snow World is a centre for various forms of recreation and entertainment. 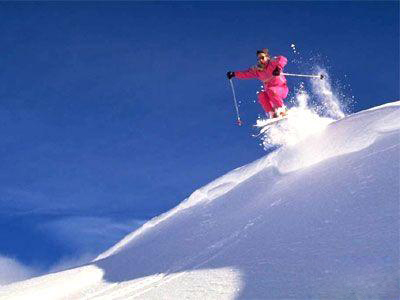 I am a fan of snow sports, so there is a chance for me to participate in those exciting winter activities such as ice rock-climbing, skating, skiing, sliding, snow fights, ice golf, and ice archery. In addition to all this, special performances based on the festival theme are put on throughout the event which will no doubt greatly entertain those in search of something a little less physically-demanding. 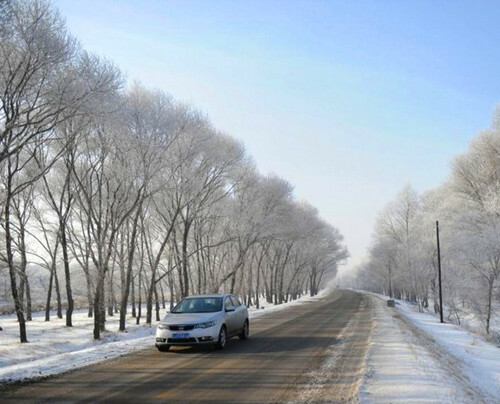 The best time to travel to Harbin is in winter. 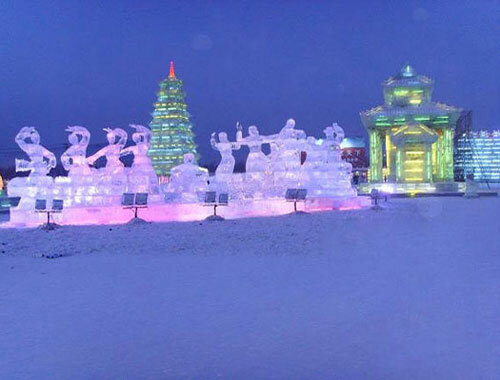 The Harbin Ice and Snow Festival is held either in late December or in early January, and for those who dream of an exciting winter experience. 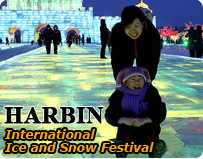 Harbin Ice and Snow World is the ideal place to make those dreams come true. One more thing I just want to tell you. 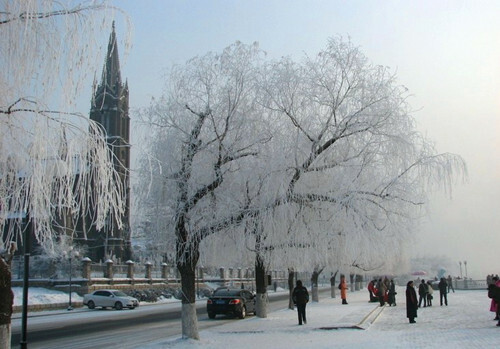 As Harbin’s location near the Russian border, it provides icy temperatures for most of the year. Remember to wrap up warm!